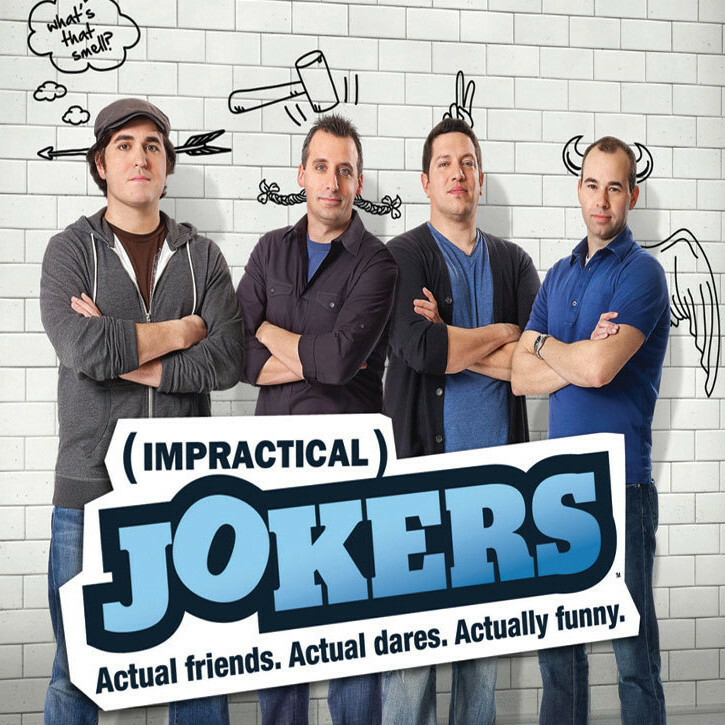 I had never heard of ‘Impractical Jokers‘ before I was sent this DVD to watch. This first season debuted on TruTV, and features four best friends who pull pranks and jokes on themselves and the general public with hidden cameras. It’s like ‘Candid Camera‘ meets ‘Kenny vs. Spenny‘, and should give you and your group of sick and twisted friends some fun ideas to pull on each other or unsuspecting friends and family. At the end of the day, this isn’t anything new or original, but packs some good laughs and keeps you watch to see what they’ll do next. The four best friends are Joe, Sal, Q, and Murr, or shall I say a part of a comedy troupe that excels in comedic improv. There is a certain prank that is thought up and one or all of the comedians pull these stunts to the real general public with hidden cameras. Most of the time, the other three comedians feed lines to the 4th funny man. It’s a swell set-up, but could become tedious and repetitive as time goes on, as we tend to see more or less the same thing over and over. This is best viewed in short spurts and not all at once. This is also setup as a competition of sorts, where the comedian with the least successful pranks is “punished”, and must perform a humiliating act at the end of the episode, although none of the punishments seem to severe. Some of the pranks range from running and grabbing items from a strangers shopping cart in a market, ask bizarre questions to people in funny settings, and pose as various employees, such as bakers, fast food workers, and bouncers. Most of it is quite funny. But again, it’s nothing you haven’t seen before on a previous tv show or youtube clip. There has been two seasons of this show so far with an upcoming third season airing in January 2014. These guys seem to have a lot of fun together and good chemistry. They play off each other very well, and wouldn’t be surprised if they branched out to film soon. If you’re a fan of the whole prank/hidden camera genre, then be sure to check this out. ‘Impractical Jokers’ comes in a widescreen DVD format and is NOT in 1080p. The standard definition picture still looks good, but lacks the impeccable detail that blu-ray has going for it. Things look a little dark from time to time and a bit soft, but it never takes away from the viewing experience. Plus a lot of the show is filmed from hidden cameras, so it isn’t exactly the best cameras for film or tv being used here. The audio has a 2.0 Dolby Digital mix and sound good for what it is. The dialogue is always crystal clear and easy to understand, as you won’t miss one single joke. There were no pops, cracks or hissing in this audio presentation either and is a run-of-the-mill audio mix. Deletes Scenes (9 mins.) – There are 12 deleted scenes in total, and if you like the show, you’ll want to see what didn’t make the final broadcast, which I guess was for time constraints. Behind the Scenes (8 mins.) – This really isn’t a behind the scenes extra, but more of the ‘Best Of’ each comedian from the first season. Nothing to much to see here. Meet the Stars of ‘Impractical Jokers’ (6 mins.) – Again, we have the four pranksters or jokers who discuss their strengths and why they enjoy doing this. Audio Commentary – There are five commentaries total on five different episodes that feature the four guys. They discuss filming the episodes in question and the pranks. There wasn’t anything too entertaining about these commentaries. 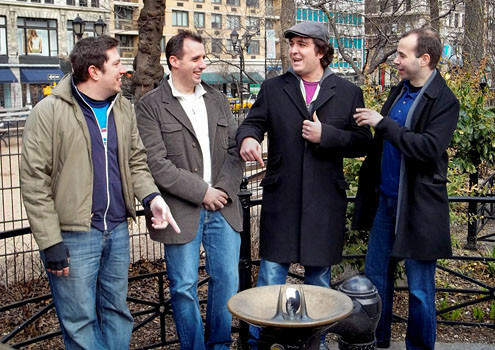 Season One of ‘Impractical Jokers’ isn’t anything new, but is fun enough to give it a shot. I’d say rent this before purchasing. This entry was posted on Thursday, December 12th, 2013 at 6:36 pm	and is filed under News, Television. You can follow any responses to this entry through the RSS 2.0 feed. You can skip to the end and leave a response. Pinging is currently not allowed. « Film Review: ‘The Hobbit: The Desolation of Smaug’!! Sofie, Sofie, my Sofie. I'm so sorry. Please... please forgive my betrayal. But still nothing. Nothing, except my aching heart, at what she's done to my beautiful and brilliant Sofie.